With its origins dating back to the 15th century and several recorded deaths during the construction of the Victorian viaduct which towers above, Daniels Mill is an archetypal historical landmark. The Mill has been in the same family for at least 250 years and would have been at the centre of the rural community throughout that time. It is now owned and run by the Daniels Mill Trust with the aim of preserving it as a working mill for future generations. The first ever paranormal investigation of Daniels Mill was carried out by Paranormal Friends in January 2019 and we were all almost overwhelmed by the level of paranormal activity that we seemed to encounter. Some of it was just a little “dark” and left most of us moved by the experience. We just have to go back to see what more of the history and occupants of this ancient place we can encounter. Daniels Mill has the largest still working waterwheel that powers a corn mill in England and has been restored to its former glory. 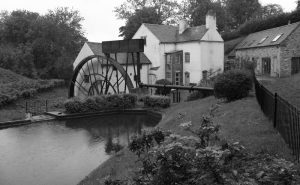 The watermill is virtually unaltered since the 18th Century set deep in a wooded valley crossed by the 19th century viaduct carrying the Severn Valley Railway to Bridgnorth. Daniels Mill was originally part of the Pitchford Estate of the Otteley family, who owned much of the land in Bridgnorth and surrounding parishes. The earliest reference to the Mill and land surrounding it appears around the late 15th century, when it was known as ‘Donynges’ or ‘Dunnings’ Mill. 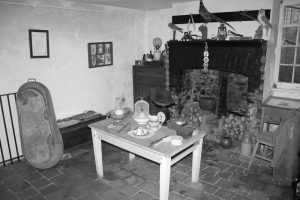 It remained in the hands of the estate until the 18th century, and in the early centuries was probably worked by a Journeyman Miller, who would visit the mill when there was work for it to do. It is likely the first enlargement would have taken place around the early 17th century, when land was obtained to construct the upper or top pool. When this pool was made, a small Mill was built under its dam. All that remains of this mill is the back wall and the watercourse. 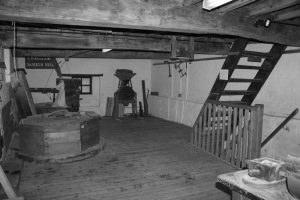 The present wheel was installed around the middle of the 19th century and replaced an earlier wheel on the same site; evidence of where the shaft of this wheel entered the building can be seen in the bottom of the mill. Documents have been found which show that as early as 1843 a steam engine had been purchased to work in conjunction with the present wheel. The Mill is now in the care of a Trust which aims to restore it further so to protect it for generations to come. Peter, the surviving member of the family is one of the Trustees and takes an active part in assisting the trust and may join us at the start of the investigation. 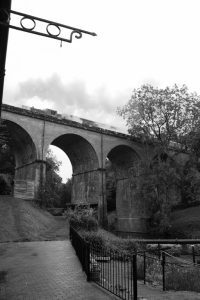 Our investigation will include vigils in the ground floor living quarters, several floors of the working mill and subject to the weather, brave investigators will be invited to explore further up the foreboding, deep and dark valley, beyond the towering viaduct to the ruins of the original Mill building. These usually include; Victorian style Séances, Table tipping experiments, Glass divination, K2 Meters, Spirit/Ghost/Frank’s box, Rempods, Laser grid lights, sound enhancers, pendulum, human pendulum, divining rods, trigger objects, digital voice recorder, photography and of course, your own senses, the original investigation equipment! We may even try some of the experiments we were introduced to by the Australian Paranormal Society! Please feel free to bring your own investigation equipment. Hot drinks, biscuits and crisps will be provided on the night. You may bring your own additional refreshments if you wish but, of course, no alcohol. 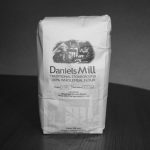 On this occasion, guests will be given a complementary bag of Daniels Mill stone ground flour. Car parking: on the right hand side as you approach the mill building.